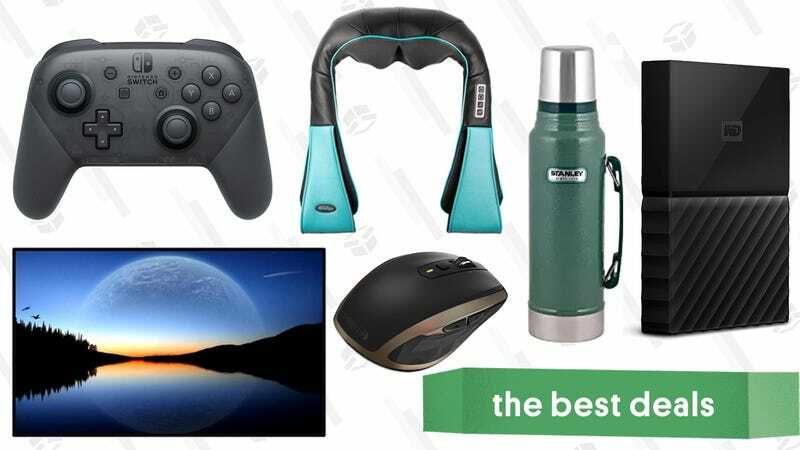 A PC parts and accessory sale, Stanley vacuum mugs, a Logitech mouse that works anywhere, and more are all part of today’s best deals from around the web. Amazon just kicked off another big tech sale, this time focusing on PC parts and accessories, including <gasp> a number of reasonably-priced graphics cards. If you’re building a PC, there’s a lot to like here, but everyone could use a new external hard drive, or maybe an inexpensive new router. On the PC part side, here are a few highlights, but head over to Amazon to see the rest of the deals. Update: This promotion is scheduled to end today (though they’ve extended it before), and it’s unlikely we’ll see another deal this good on the 4K Apple TV any time soon. If you’re ready to make the switch to a projector-based home theater, or if you recently picked up a portable projector, this is one of the most affordable screens we’ve ever seen. Just use promo code 8WUFNTEI at checkout to get the 120" screen for $10, complete with 20 Velcro strips to help you hang it up. Audio Technica’s ATH-M50s have long been our readers’ favorite over-ear headphones, but it’s 2017, so you’d be forgiven for only considering wireless cans at this point. Luckily, their ATH-S700BTs are on sale for an all-time low $99 today, complete with 40mm drivers, and the ability to use them in wired mode if the battery dies. Luminoodle’s new professional bias lights aren’t the cheapest bias light strips out there, but there’s good reason for that: They’re one of the few options that can output true 6500K white. AV geeks strive for this, as 6500K won’t affect your eyes’ perception of the screen’s color accuracy. With the press of a button on the included wireless remote, you can also choose from 15 different backlighting colors too, if you’re in the mood for a more festive look. Today, you can save 20% on both the large (meant for TVs 40" and below) and XL (75" and below) model with promo code 20DX5WM7. If you’ve been curious to try computer glasses, but were scared off by the sky-high price of Gunnars, Velocifire will sell you a set for $17 today with promo code EVCKXW8Z. If you aren’t familiar, the appeal of these things is that they block out the blue light that emanates from the screens we stare at all day, which can cause eyestrain, headaches, and even insomnia. They do not, however, block bad tweets, which can cause the same symptoms. Our readers love Logitech’s MX series of mice, and the versatile Anywhere Mouse MX 2 is down to easily its lowest price ever today. We’ve posted a lot of deals over the years on the original Anywhere Mouse, but the second generation adds a rechargeable battery and (optional) Bluetooth to the mix, which are two huge reasons to upgrade. And of course, it still includes Logitech’s dark field laser sensor, which means it can be used on any surface, including glass. You can never have enough USB charging gear, and today, a couple of bundles from Anker let you stock up and save on a variety of products. First up, for $50 (with promo code ANKERPP1), you get an aluminum PowerCore+ 10,050mAh battery pack, a four-port travel wall charger, and nylon-braided PowerLine+ Lightning and microUSB cables, all packaged in a premium carrying case. You’re saving a bunch of money here by bundling, even accounting for sale prices on the individual gear, and this could make a great Father’s Day gift as well. Or, for $40, you can get a Qi charging stand, a Qi charging pad, and a two-port USB travel charger with 24W of power. The wireless chargers are bundled together for $40 by default, but you’ll have to separately add the wall charger to your cart and use promo code COMBOAAA to get it for free. For a limited time, Verizon’s offering up $50 prepaid Mastercards as a rebate when you spend $200 on select mobile accessories. You can find all of the accessories here, though the promotion is only eligible for accessories with the “Spend $200 get $50 back” banner. Note: After you place your order, you’ll have to go to this page, enter promo code GET50, and submit your order details to get the rebate. Eligible items include Fitbits, Ring doorbells, and Nest products, though the most intriguing option is Apple’s AirPods. You’ll need to buy two of them to get over the $200 threshold, but they’re excellent, and basically never go on sale, so find a friend who wants a pair, and split the $50 bounty. This gadget stand is made of aluminum, looks great, can hold your device at different angles, and is only $8 with promo code AHCH53UG. What’s not to love? Prices still haven’t totally recovered from the crypto-driven worldwide GPU shortage, but this 8GB MSI GTX 1070 is a pretty solid deal at $450. That’s $50 less than Amazon’s current price, which itself is the best price since early February. You’d expect a $220 TV to be stripped of basically all features, but this 49" set from Hisense actually has smart apps, HDR support (though not Dolby Vision, sorry), and yes, even 4K resolution. It’s obviously not the best TV you can buy, but it’s a hell of a bargain. Update: The 3' cables are sold out, but the 6' deal is still available. We see deals with some regularity on Anker’s 6' nylon-wrapped Lightning cables, but today, you can also upgrade your standard 3' cords for just $8 each. These cables feel ridiculously nice in the hand, are way more durable than Apple’s first party cable, and comes with a lifetime warranty, so what’s not to love? Just use promo code AKLTNNEW on any color of either size to save. If you’re still listening to your computer through its built-in speakers, stop torturing yourself and buy Logitech’s MX Sound 2.0 audio system for $70, or $30 less than usual. In addition to connecting to your PC with a 3.5mm cable, the MX Sound also includes Bluetooth to pair to your phones and tablets, with one-touch switching between devices. And not for nothing, they happen to look way better than most computer speakers, which matters for something that sits out on your desk all day. Anker’s SoundBuds Curves were a runner up in our recent affordable headphone poll (they were only beat out by Anker’s own SoundBuds Slims), and you can grab a pair for just $22 today. Just use promo code 4N7I447D at checkout to save $4. Maybe it’s time to upgrade from the bedding that has a fitted sheet without elastic and a top sheet with bleach stains to something a little nicer. Amazon is marking down a ton of sheets from Threadmill Home Linen, today only. Choose from colors and patterns that fit your style. There’s even some Supima cotton options. You’ll sleep better at night, but don’t sleep on this deal. Everyone has fond memories of smelling the Yankee Candle store from halfway down the shopping mall’s hallways. It’s a rite of passage to attempt to walk by without getting a headache. But their candles really are great, and with this sale, you can have those scents in your home for even less. You can add any two of their large jar candles to your cart for $30 (basically a BOGO), or five for $55, plus extra savings at checkout when you use promo code JUNE15. These candles burn for 110-150 hours each, so at these prices, they’re a terrific value. If you didn’t pick up a robotic vacuum during Deals Week, the Darth Vader edition of the Samsung POWERbot R7040 features a ton of vacuuming power, a suite of sensors that help it map out your room, and mercifully, a washable filter. $270 is an all-time low price for this model, and significantly less than the non-Darth Vader equivalent. One of the only downsides of cast iron pans is that they can be a nightmare to clean, but this chainmail scrubber can scrape away caked-on food without hurting your seasoning, or resorting to soap. No wonder one of them is in our bestsellers club. Today’s $6 deal (with code SWUASXR3) also happens to be the best price we’ve ever seen on one of these. If you missed the portable AC unit Woot sale a few weeks ago, you’re in luck because they’re running another one today. Roll in one of these LG portable air conditioner units in your bedroom, living room, garage, or anywhere else that might need a little extra cooling this summer. You can grab a refurbished one for around $290 from this one-day-only sale. Portable is funny term for these. Yes, they do roll, but you’re probably not going to want to move it around everyday since you’ll have to connect it to a window and power source. That being said, it is a whole lot easier than moving a window unit. I have the LG 1417GSR in my living room now and I’m impressed by how much cooling power it has. Both 14,000 BTU units both come with remote controls because sometimes it is too hot to get up. If you’re trying to decide between the two, the 1414GXR is a little thinner, removes slightly more moisture from the air, and is designed to cool a room up to 600 sqft. compared to the 1417GSR’s 500 sqft. This all-terrain Mighty Max cart is here to help you lug around your cooler, chairs, furniture, sports equipment, and more for just $110 today. With four off-road-ready wheels, an easy grip handle, an expandable flat bed frame (31" to 38"), and two bungee cords, this cart is ready to pull to up to 300 pounds of your stuff around, even on sand. When you’re not using it, the side gates fold down and the handle folds back for easy storage. Plus, you can loan it out to friends instead of actually being there to help them move (it’s probably more helpful, and will drink less of their beer anyway). It’s just $110 today from Woot, that’s about a $40 discount from the usual. But this sale will only last until the end of the day or until it sells out, so don’t let this deal roll away from you. If you missed it during its brief window of availability earlier this month, Amazon’s snack sample box up for order, and it’s basically free. Spend $10 to get eight or more snack samples to munch on, and then use the included $10 credit to buy more of your favorites. The exact contents of the box will vary, but RXBARS cost about $2 each at the store, and it seems like you’ll get a nice mix of healthy options and indulgent junk food. When changing your chair isn’t an option, BackJoy can improve your posture and add cushioning to any seat, whether it’s at home, in your car, or at your office. For a limited time, promo code LFHKR20 will save you 20% sitewide at Backjoy when you spend $45, including accessories like their massage products and their strap-on lumbar pillow, which I tested out and really liked. Plus, when you add $45 of products to your cart, you’ll get a trigger point self-massager added for free. If you’re still living like some kind of wild animal and keeping all your toiletries in the front pocket of your suitcase when you travel, upgrade to this AmazonBasics hanging toiletry bag for just $12 today. The best part is you won’t use up any (often very limited) hotel bathroom counter space, since this bag’s hanger clip can hold all your stuff on the back of the door when not in use. Plus, it’s made with a leakproof lining, so it won’t cause a disaster if anything explodes during travel. This 28 piece Pyrex set includes both food storage containers and bakeware plus lids for all of it, for just $33. Our readers overwhelmingly voted Pyrex food storage containers as their top pick, because they don’t stain or transfer any funky smells and last forever. This set normally sells for $40, so today’s $33 price is a great one. It might make a nice housewarming gift too. Boiling isn’t the only way to cook eggs in your Instant Pot. This $7 silicone tray lets you create scrambled egg bits filled with the veggies, spices, and meats of your choice. Just pour your scramble into each hole, cover, and cook it for 5-10 minutes at pressure, and boom: you’ve got breakfast. It also works in the microwave. Lap up savings on a dozen or so dog bones and treats from this one-day Amazon sale. They have the popular Nylabones, which are the only toys that last longer than 10 seconds at my house, and some discounted treats. Most of the toys are under $5 and most of the treats are under $14. So head over to Amazon and pick up some treats your furry friends while they still on sale. If you want to really spoil them, these memory foam dog beds are also on sale today. What’s better than $25 worth of pizza? $30 worth of pizza, obviously. Now, you can get the latter for the cost of the former. 2. Click on the Domino’s gift card in the gift card directory. 3. Select the $30 card. 4. Use promo code summerfun to get $5 off. Stanley’s iconic hammertone vacuum bottles are ostensibly designed for camping, but who couldn’t use a drinking vessel that keeps coffee hot for up to 7 hours, or cold drink cold for over a day? A bunch of shapes and sizes are on sale in today’s Amazon Gold Box, including several with lids that double as drinking cups. There’s also a camping cookware set thrown in here, just for good measure. These highly-rated PetFusion memory foam dog beds are 3 inch thick hunks of foam with side bolsters, because all dogs like something to snuggle up to. Plus, they have waterproof, tear-resistant covers to help you keep them looking new. The extra large bed is just $135 today and the large bed is $90 - both $10 less than their normal prices. These deals usually don’t last long, so I’d fetch one while you can. Give your desk or apartment a little marquee with this $16 one from Amazon. At that price, think of it as less than a cent for every slightly questionable word choice you’ll come up with because it comes with 100 letters, numbers, and emojis. Just think of all the curse words and sexual innuendos via emoji you could dream up. Update: The 10L is back up to its normal price, but the smaller rounded is still discounted. Kitchen trash cans get all the glory, but you shouldn’t neglect your bathroom trash can. It is, after all, the one short enough for pets to nose their way into, as I’ve discovered. As we know, simplehuman makes the best trash cans, and you can get their 6L rounded bathroom can for an all-time low $15 today, or a 10L rectangular model for $18, also an all-time low. These cans don’t see discounts often, and never this significant. Our readers buy a lot of tools, so it’s easy to assume that you guys have plenty of screws, nails, washers, and other little pieces to store as well. This AmazonBasics small parts organizer can keep everything easy to find with 25 adjustable compartments and a snap-on transparent lid. The coolest part about it is, if you buy more than one, you can snap them together, so your tool box will grow with you. This is a newer product, so we don’t have a ton of price history to draw from. But, it was recently listed at $18 so today’s $14 price tag is pretty good. Our readers have bought thousands of Yi’s home security cameras, and today, you can get a 1080p model for $38 with code 6NHSQU3U. Fried foods are delicious. Fried foods will kill you. These are the laws of our cruel existence, and generally-speaking, there’s no avoiding them. But this Black & Decker air fryer uses convection to achieve fried-like crispiness using no oil at all. Are the results as delicious as the real thing? Probably not, but if you believe the reviews, it comes pretty damn close. It was only a matter of time until Anker dove into the home security camera market, and you can save big on the impressive new Eufy EverCam by preordering through Kickstarter right now. The EverCam is a truly wireless camera designed for outdoor use that can operate for up to a year on a charge thanks to its built-in Anker battery. 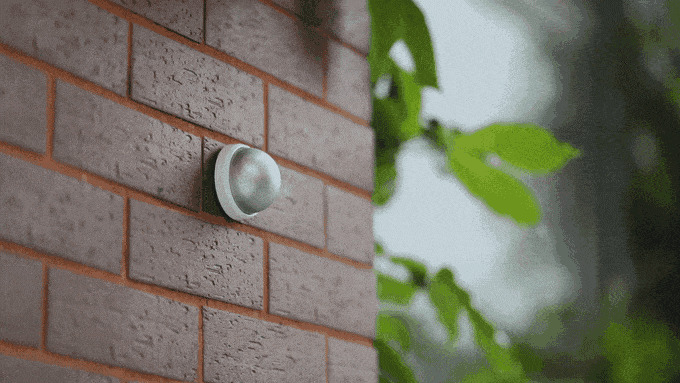 Mind you, it won’t record 24/7 for a year, but rather uses motion detection and facial recognition to record only when it detects someone on your property that doesn’t belong. Rather than streaming this footage to the cloud and charging you a monthly fee to access the recordings the EverCam, records to an included base station for free, which also has a built-in backup battery to operate for up to two days in a power outage. If you’d like to back up your recordings to the cloud, you can do that too for $3 per month, per camera. The closest analog to the EverCam is NETGEAR’s Arlo system, but Arlo cameras only run for a few months on a charge, aren’t as water-resistant, don’t include human or facial recognition, and can’t record footage locally for free. It seems like an easy call. By preordering through Kickstarter today, you can save $110 off the expected MSRP for one camera, or $160 off the 2-pack. You don’t necessarily need to buy a new mattress to get a better night’s sleep: Sometimes, a mattress pad will do, and this popular one has a $20 coupon on Amazon today. Unlike most mattress pads, these ExceptionalSheets bamboo mattress pads are stuffed with Revoloft synthetic fill, which should feel a lot like down, but without the associated allergies and poking feathers. They also feature a hypoallergenic bamboo cover. Prices range from just $50-$80 today after the coupon, depending on the size. We aren’t sure how long the coupon will be around though, so you probably shouldn’t sleep on it. While you probably wouldn’t want to use them with very expensive knives, pull through knife sharpeners are still great for reviving dull blades, and this pocket-sized model is just $9 today with promo code KD40GG. It includes your standard carbide and ceramic v-shaped stones for pulling through, plus a fold-out rod for honing your edges further. It’s a common enough occurrence, but you probably don’t have a great solution for it: When you travel with your pet, how do you transport their food? This $5 container is designed just for this purpose, and includes two built-in bowls too.It’s a pen. It’s a flashlight. It’s a multi-tool. It’s an emergency glass breaker. Most importantly though, it’s $10 with promo code T35CVTMD. It’s a matter of taste, but some might say that the new, cheaper Nest Thermostat E is even nicer looking than the original, while still packing in almost all of the original model’s features. It’s a bargain at its usual $170, but today you can get it for $149 from Walmart, plus a FREE Google Home Mini, which is arguably the best deal we’ve ever seen. These are stressful times for many of us, but at the very least, you can at least treat yourself to a massage whenever you feel like it with this $36 gadget. We’ve posted a similar product from Naipo a few times before, but this one has twice as many shiatsu nodes (eight vs. four), so it’ll feel like you have a small army of masseuses tending to your knots. Even if it’s not for you, this would make a great gift for an overly-stressed friend or family member. Whether you’re using them at home or on the road, this resistance band set lets you get a full workout basically anywhere, and at $14 (with promo code 4RLUR85I), it’s quite a bit more cost-effective than joining a gym. Nordstrom has two large sales each year: The Anniversary Sale and The Half-Yearly Sale. Well, today is about halfway through the year, so Nordstrom is taking up to 40% off a boatload of styles. Brands as disparate as Gucci, J.Crew, and Nike are all included in the sale, so it’ll take time to look through all the stuff. Maybe pencil it in as a meeting at work or something. You can disappear into Middle Earth with Bilbo and the gang with this Blu-ray box set of The Hobbit Trilogy. It’ll cost you 40 bucks today, which is within a $1 of its all-time-low price. It’s a over full 8 hours of content and bonus features, so I’d say you’re definitely getting your money’s worth. The Switch Pro controller isn’t just one of the best ways to control your Nintendo Switch, it might be one of the best gamepads ever made, period. If you have a Switch and still haven’t picked one up, $59 is within $9 of the best price we’ve seen, and a solid $5-$10 less than usual. Nintendo’s AA Joy-Con battery grips allow your controllers to run for longer on a charge, yes. But just as importantly, they make them a lot more comfortable to hold. Get a set for an all-time low $17, and throw a few rechargeable AAs in your cart while you’re at it. If you have Amazon Prime, congrats, you also have Twitch Prime. And if you have Twitch Prime, you get some free PC games every month, no strings attached. Starting on today (yes, I know it’s not actually June yet), you’ll get access to five new games, including Tumblestone, The Banner Saga 1 and 2, and Strafe. All you have to do is connect your Prime and Twitch accounts here, then check back on May 1 to download your games. Just click the loot icon on the top of your Twitch homepage to find all of the freebies. Once you add them to your library, they’re yours to keep, even if you cancel your Prime membership further down the road. Preorder Fallout 76 [PS4] | $48 | Amazon | 20% Prime discount at checkout. Preorder Fallout 76 [Xbox One] | $48 | Amazon | 20% Prime discount at checkout. Preorder Fallout 76 [PC] | $48 | Amazon | 20% Prime discount at checkout. We still don’t really know much about Fallout 76, but if you figure you’ll buy it no matter what, you can preorder now on Amazon (PS4 | Xbox One | PC), with 20% off at checkout for Prime members. As always, you won’t be charged until it ships, and you can always cancel if they do, in fact, turn it into an MMO. If you enjoy realistic army shooters, it doesn’t get much better than ArmA, and Humble just kicked off a huge bundle with all three games, plus a ton of DLC. Humble kept things simple for this one: You have to pay $1 to unlock all the ArmA content, the average price (currently about $7) for ArmA 2, $15 for ArmA 3, and $20 to get ArmA 3's Apex DLC. Let’s be honest though, you’re going to spend most of your time playing the April Fool’s kart racing DLC. Mega Man 11 just got an October 2 release date, and now you can get your preorders in. As always, Prime members will save 20% at checkout, bringing the new side scroller down to $24 on PS4, Xbox One, and Switch.